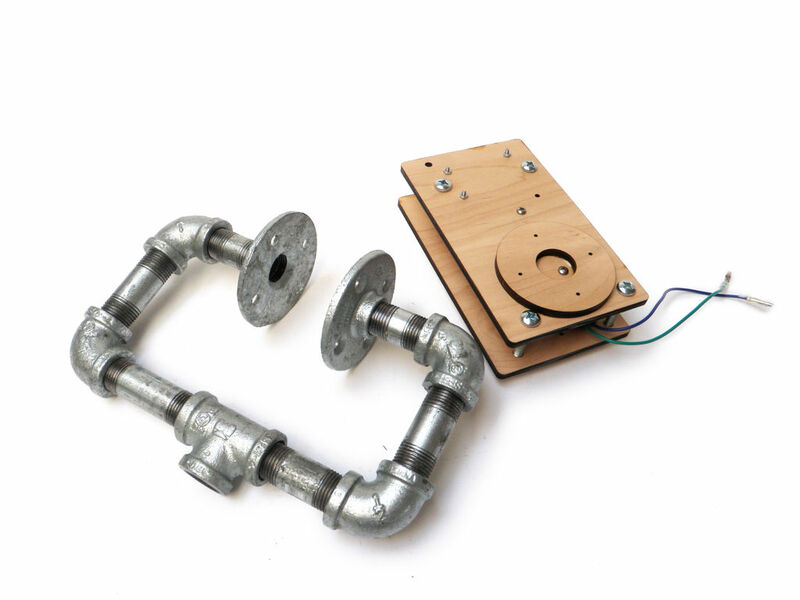 For years I have been telling anyone who listens that I was going to build a robotic drum. Most people kind of shrugged indifferently. Even as I built it, most people kind of glanced over at it and conveyed doubtfulness. It seemed like no one but myself was convinced of just how awesome it was going to be. I received a lot of snarky comments about how I was making a strange annoying noise maker. When I finally go it set up for the trial run, I quickly silenced the naysayers. This robotic drum blew everyone away. I was finally able to convey my vision and explain why someone would ever want to build a robotic drum. 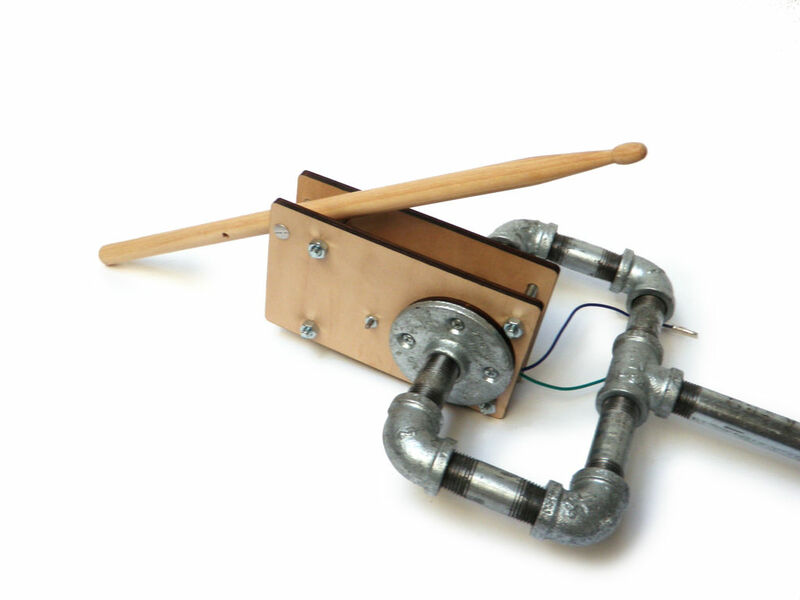 The reason to build a robotic drum is because it is plain super-awesome. It keeps a beat like clockwork. You can slow down and speed up any drum beat with precision and ease. It can even play things a real human drummer could never do. I intend to use mine for rocking out. 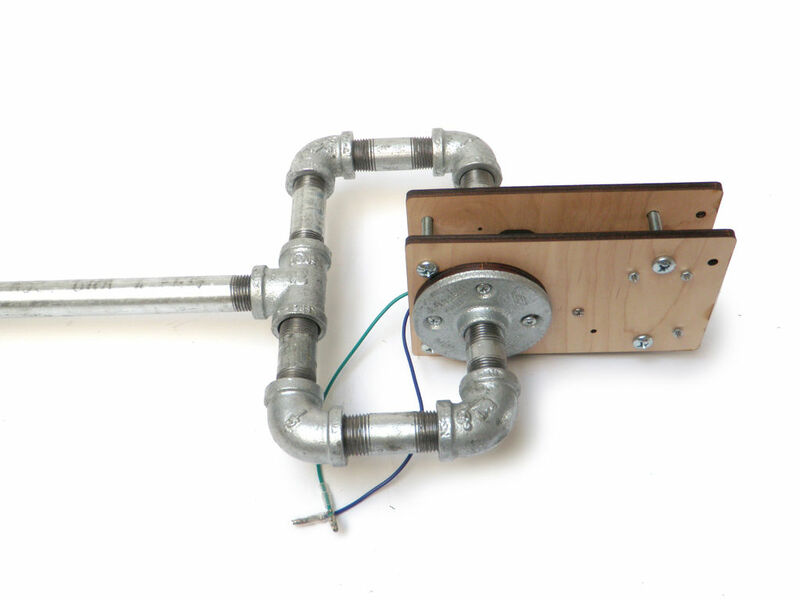 The current plan is to program it with different drum beats and play guitar along with it. I decided to use linear actuators (car door lock motors to be exact), and Arduinos with motor controller shields simply for ease of use and duplication. I am sure there are other more elegant ways to interface with the motors, but this is by far the easiest. Take two of the pieces of the standard drum bracket (without Arduino mounting holes) and sandwich a motor in-between. 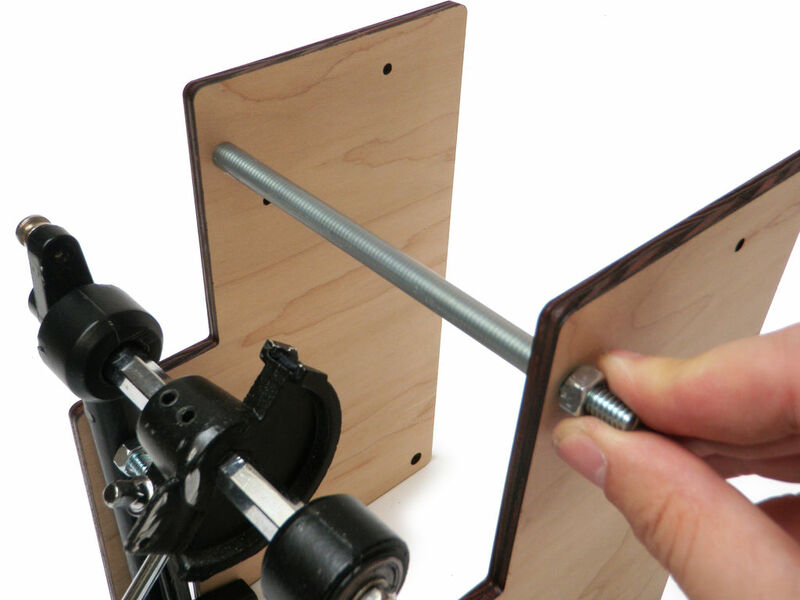 Fasten it through the center mounting holes using 6-32 nuts and bolts. 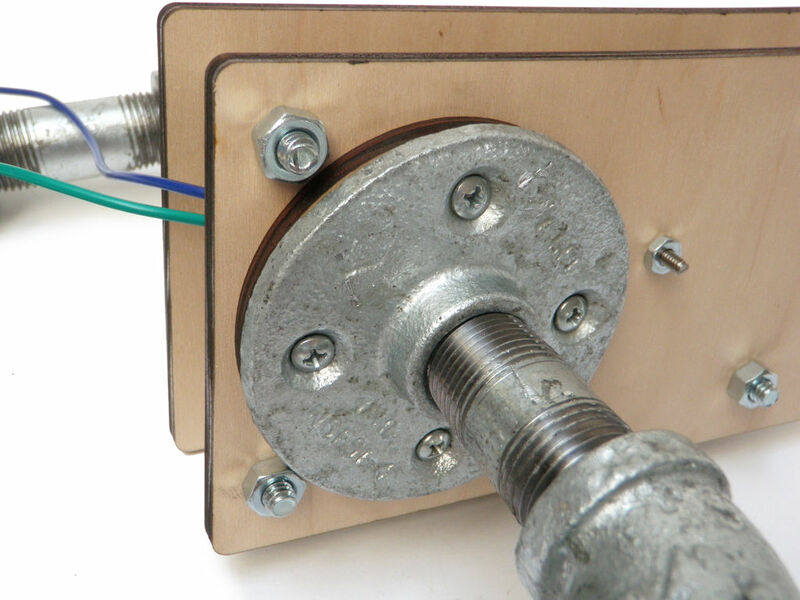 Pass 4-40 bolts through the Arduino mounting holes on one of the drum brackets and loosely hold them in place with bolts. Once the bolts are passed through, make another motor bracket "sandwich" like you did in the last step. Pass a 5" x 1/4 bolt through on of the corner mounting holes in the motor bracket "sandwich" that is prepped for the Arduino. Repeat for all of the other holes. 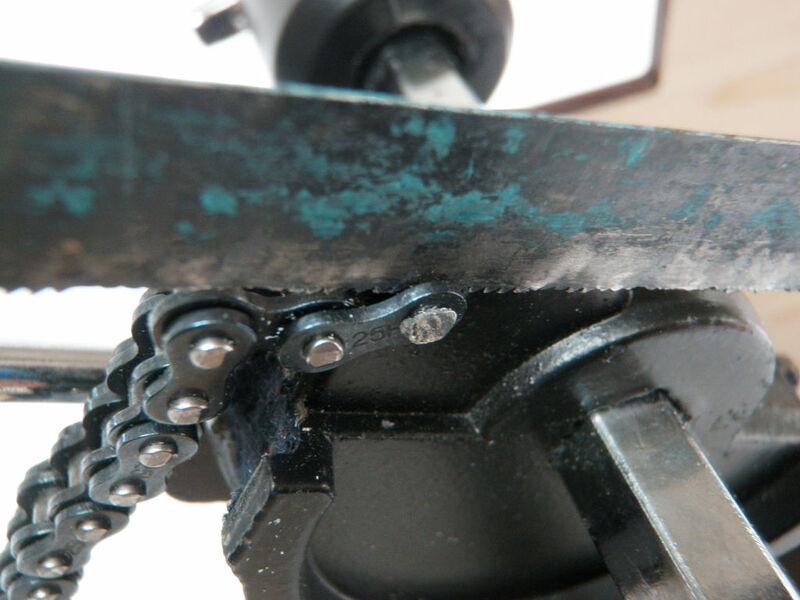 Slide a spacer over each of the bolts and then thread more nuts on to hold them all in place. Slide the other motor bracket "sandwich" onto the bolt. Fasten everything securely in place with another nut. 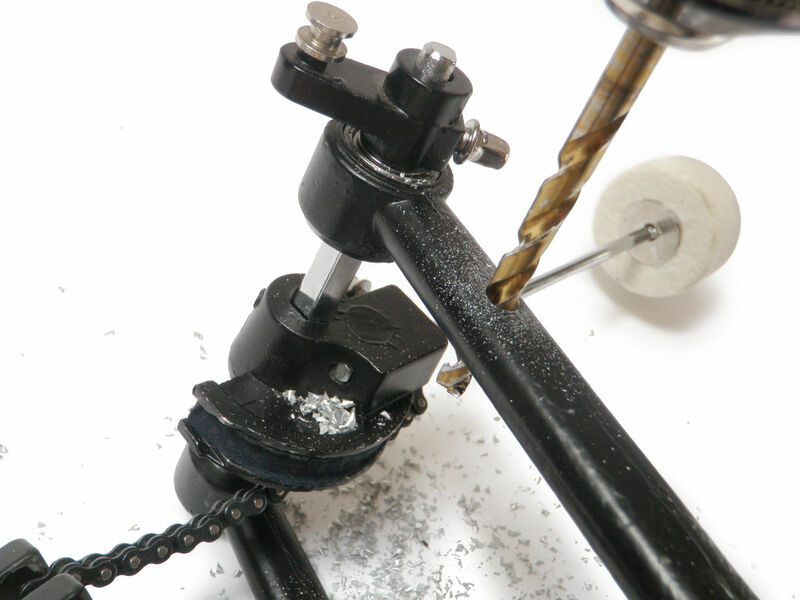 Tape two drumsticks together and then fasten them securely into a vise in preparation for drilling. 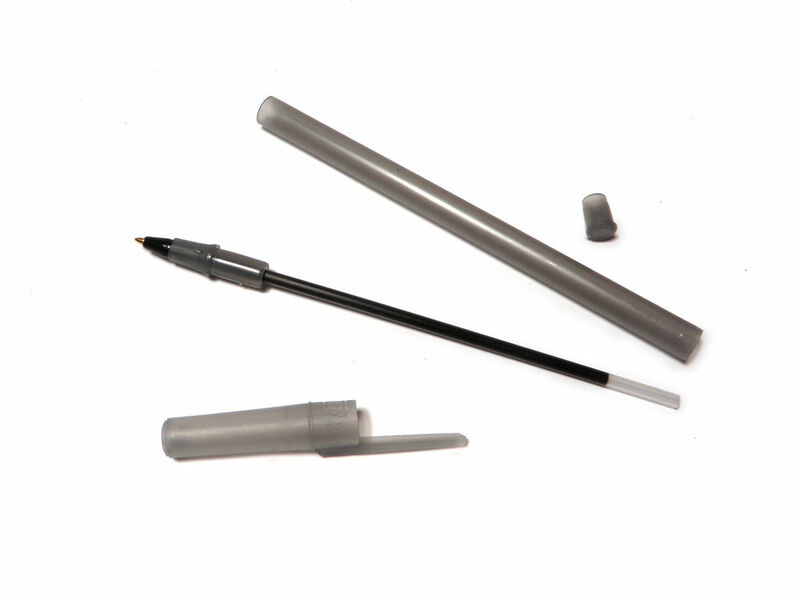 Make a mark at 5-1/8" and 7-1/4". Repeat this process 5 more times, to make 6 sets of drilled drum sticks. Grab the complete drum stick assembly. Pass a binding post from the outside of the assembly through the corner pivot hole, through the hole in the drumstick closer to the tip, and then through the inner pivot hole. Fasten the binding post shut. Zip tie the drum sticks to the motor assembly using the other drilled hole. Repeat this process for the other motor. After you build your first complete drum stick assembly, build three more. 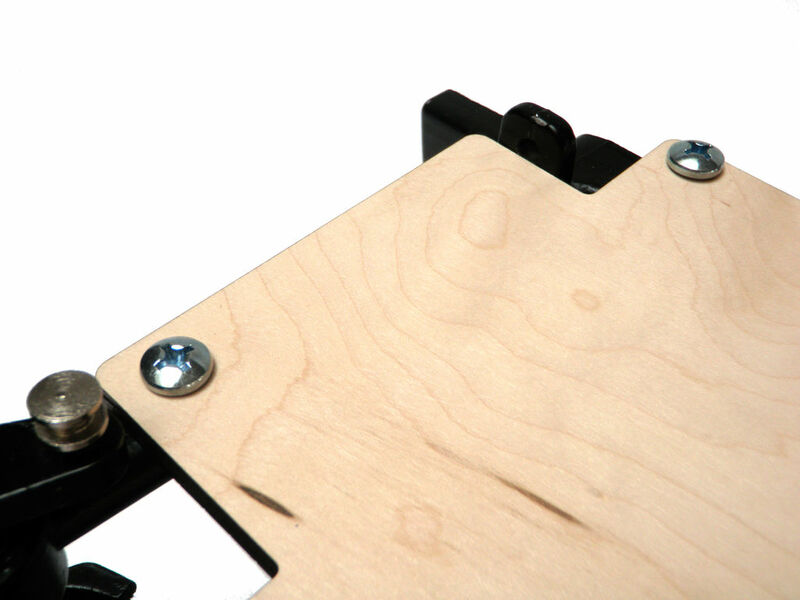 The motor bracket "sandwich" assembly for the hi hat cymbals requires and extra piece of wood attached on each side of the outside of the assembly. 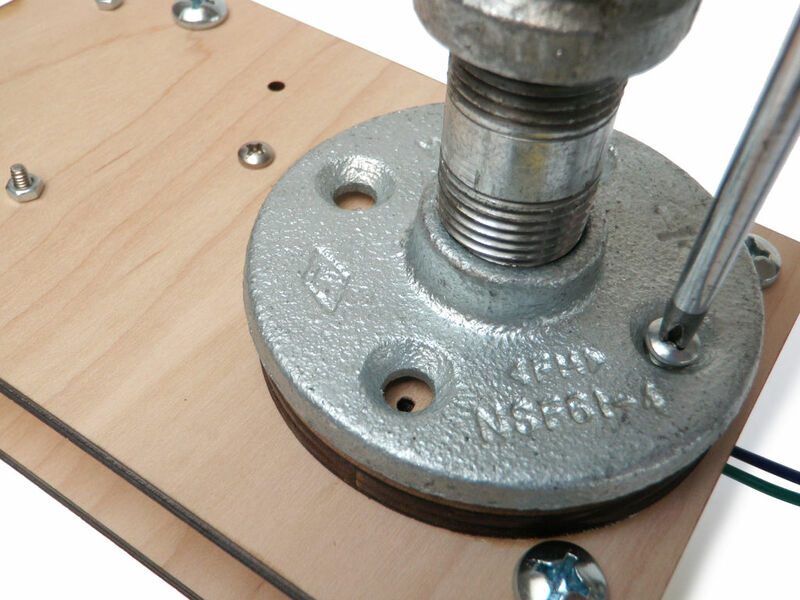 To attach this wood piece, simply lay down a little bit of wood glue, align the pre-drilled 1/8" pilot holes, and then once aligned, clamp them in place. 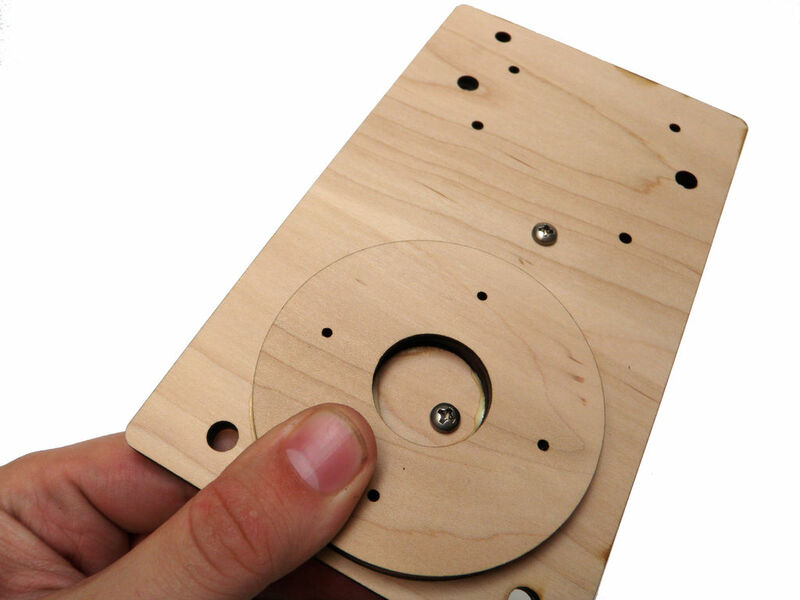 Don't forget to make certain that one of the pieces you are gluing the wood piece to has holes for mounting the Arduino. Take your brackets and make two more motor "sandwiches," such that when they are ultimately assembled, the pieces with the extra wood piece glued on will be facing outwards. Put together the motor assembly like previous motor assemblies, will paying special attention that the pieces with the extra wood piece glued on are facing outwards. 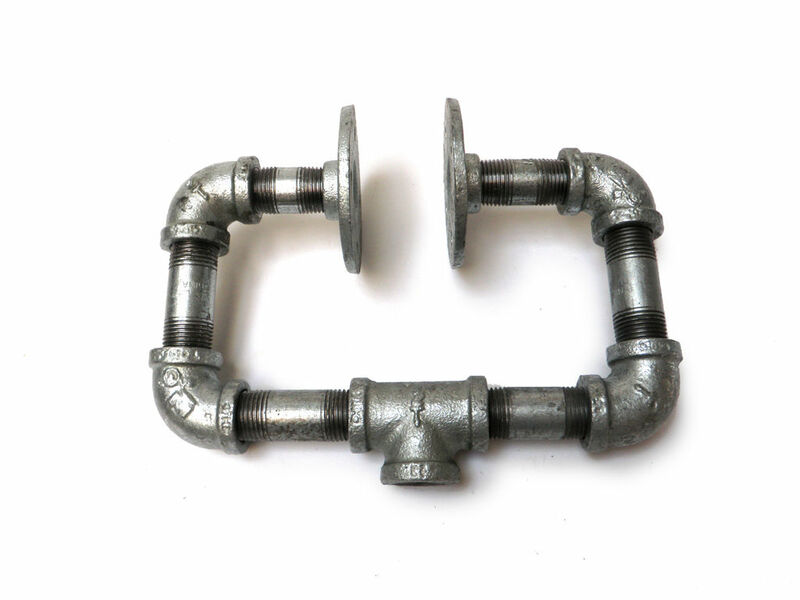 Start with a T-bracket and thread a 3" section of threaded pipe on each end. 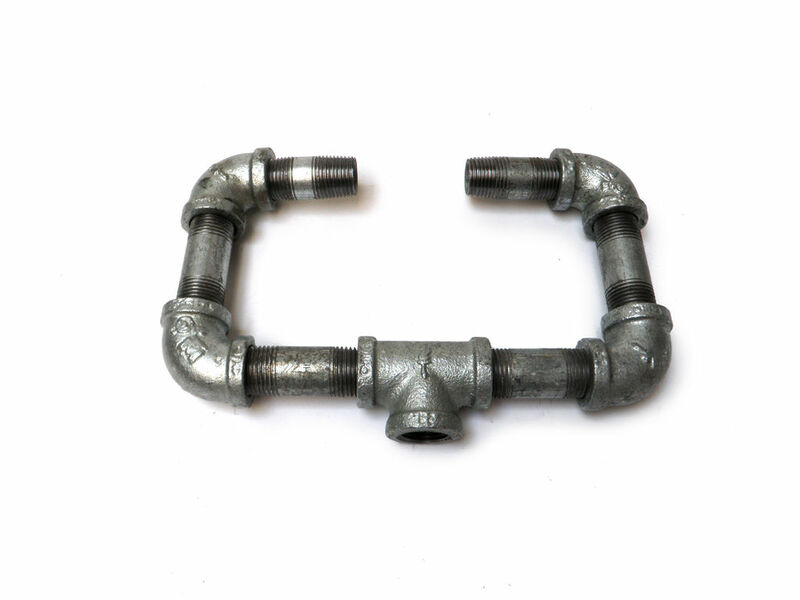 Connect L-brackets to each end of the respective threaded pipes. Thread a 2" section of threaded pipe onto the end of each L-bracket. 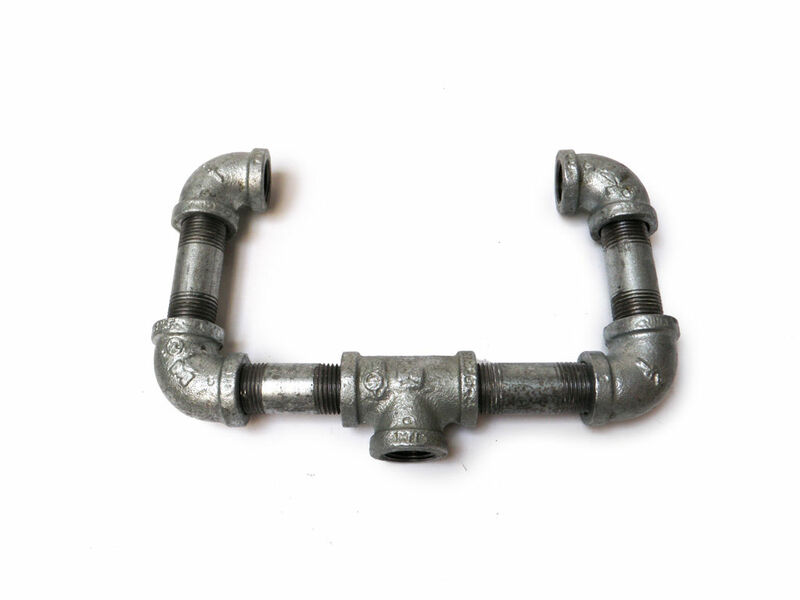 Again, put L-brackets on the end of each respective threaded pipe. Thread a 1" section of threaded pipe onto the end of each L-bracket. 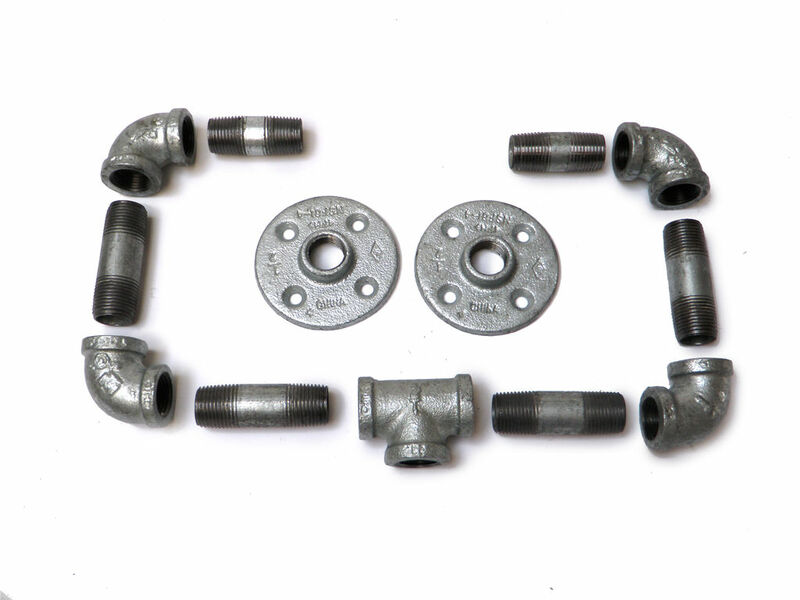 Finally, attach flanges to the end of each threaded pipe. 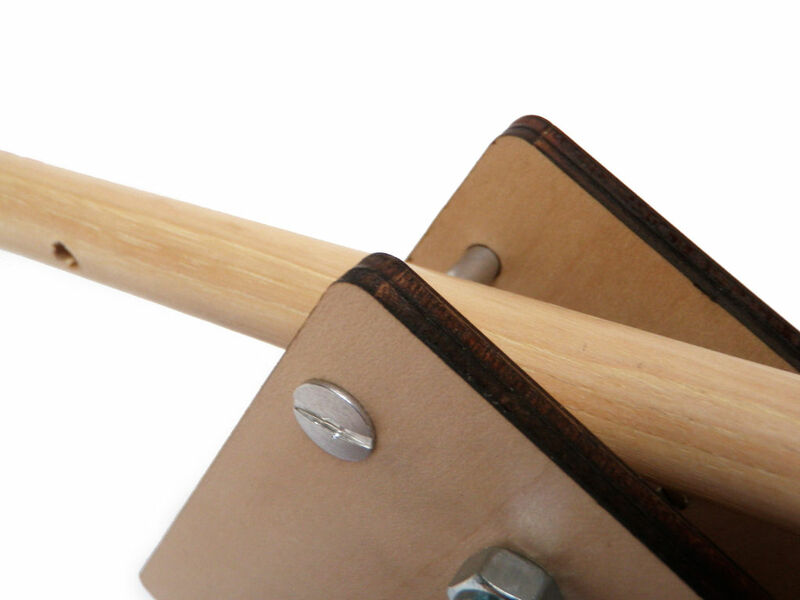 Slide the flange over the extra bit of wood on the drumstick assembly until they are aligned. Rotate the flanges as necessary so that the pilot holes are aligned with the flange's mounting holes. Fasten the drumstick assembly to the mounting bracket place with wood screws. 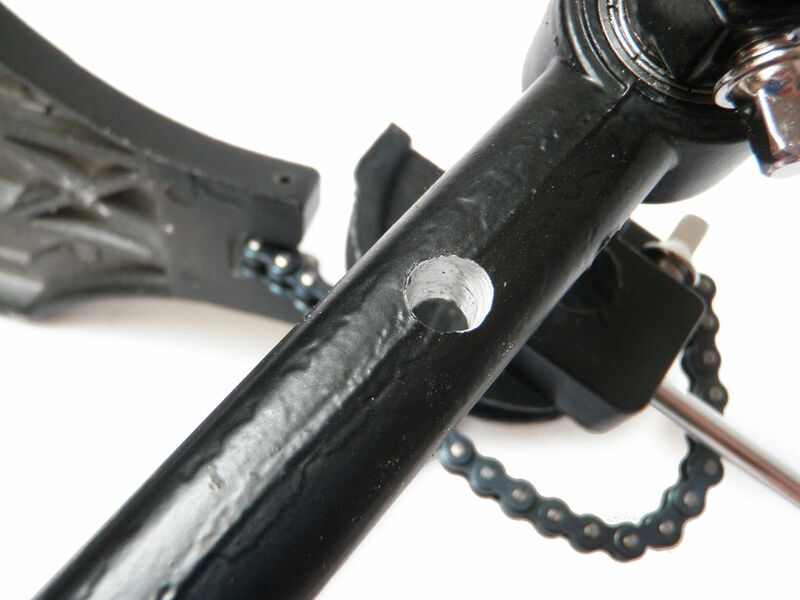 Attach the 18" threaded pipe to the base of the T-bracket. 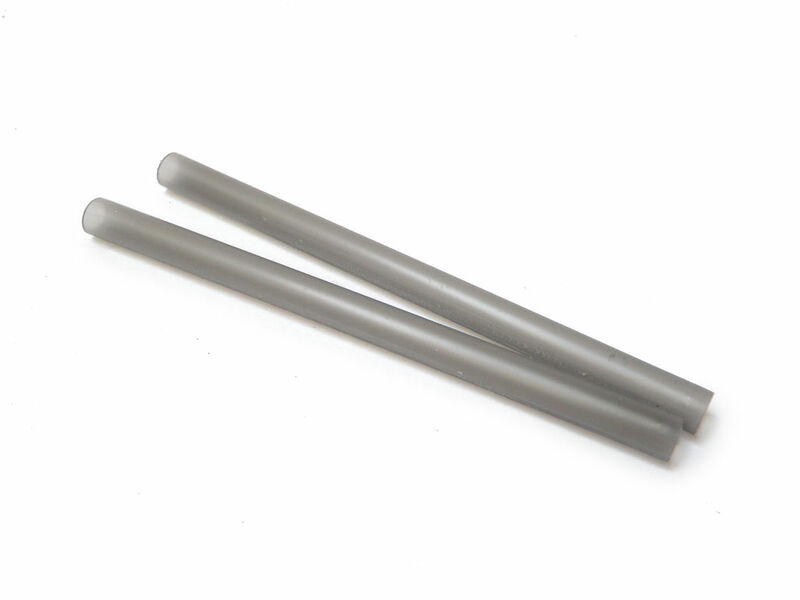 Using the binding posts, mount the drum sticks like you did for the previous drum stick assemblies. Again, zip tie the drum sticks to the linear motor assembly. Again you will need to attach an extra wood piece to the wooden bracket sfor the cymbal assembly mount. However, because the cymbal only uses one stick, you only have two brackets and will need to glue the wood to each. 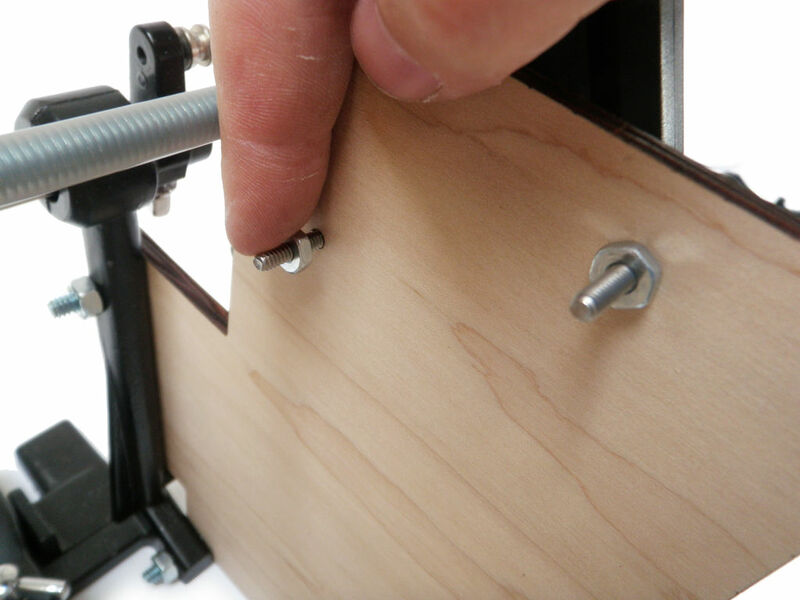 Make sure that when you do this, the extra piece of wood will be on the outside when you make your motor "sandwich." Simply lay down a little bit of wood glue, align the pre-drilled 1/8" pilot holes, and then once aligned, clamp them in place. 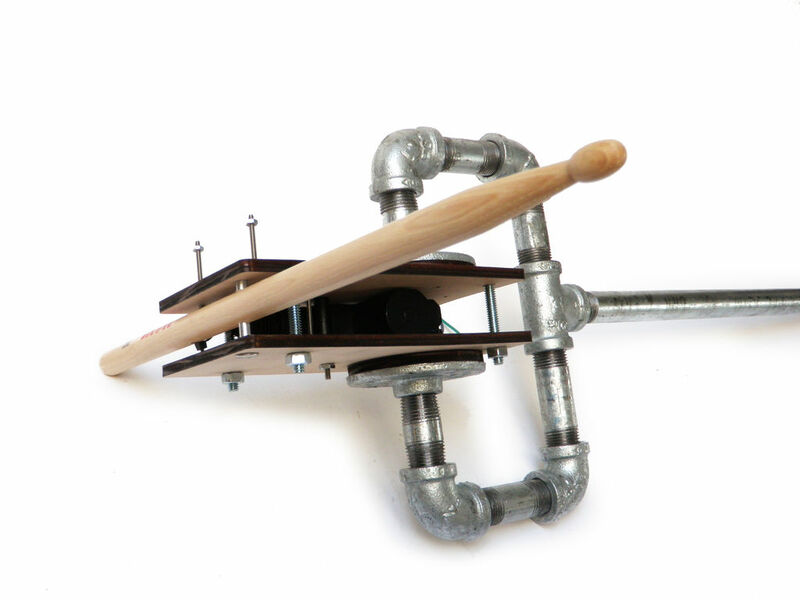 The cymbal drumstick assembly only has one motor "sandwich." Assemble it accordingly, with the extra bits of wood facing out. 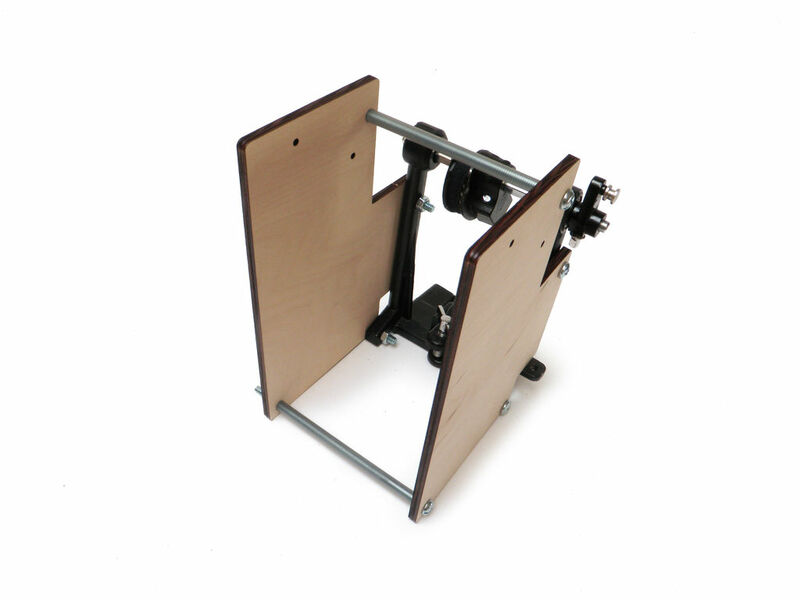 Don't forget to install the Arduino mounting screws as well. 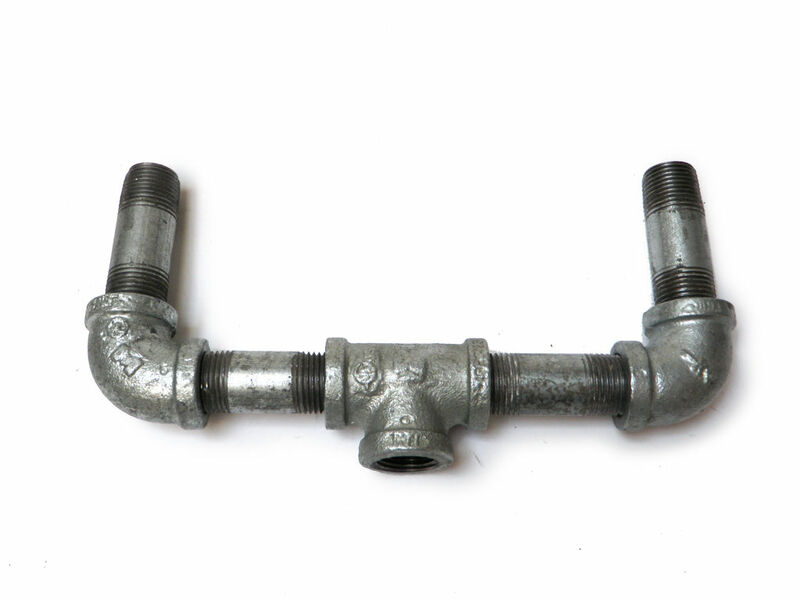 Start with a T-bracket and thread a 2-1/2" section of threaded pipe on each end. 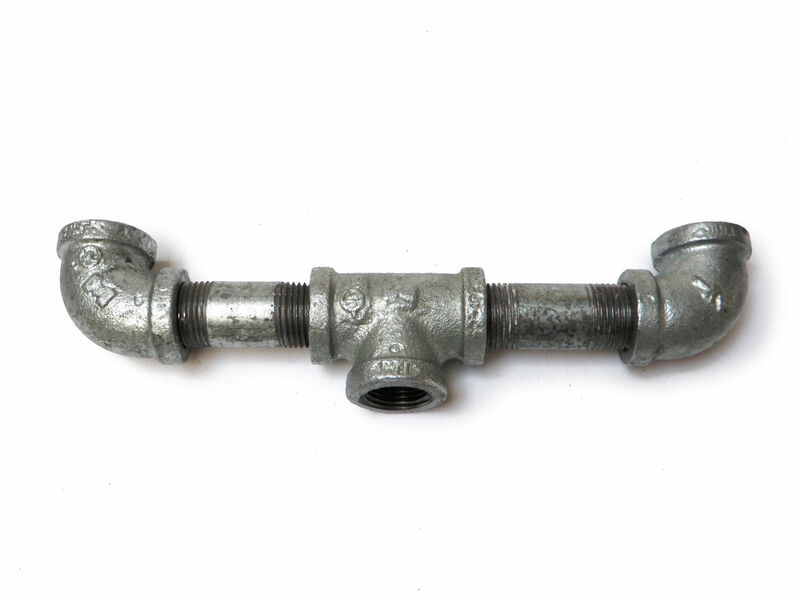 Thread a 2-1/2" section of threaded pipe onto the end of each L-bracket. 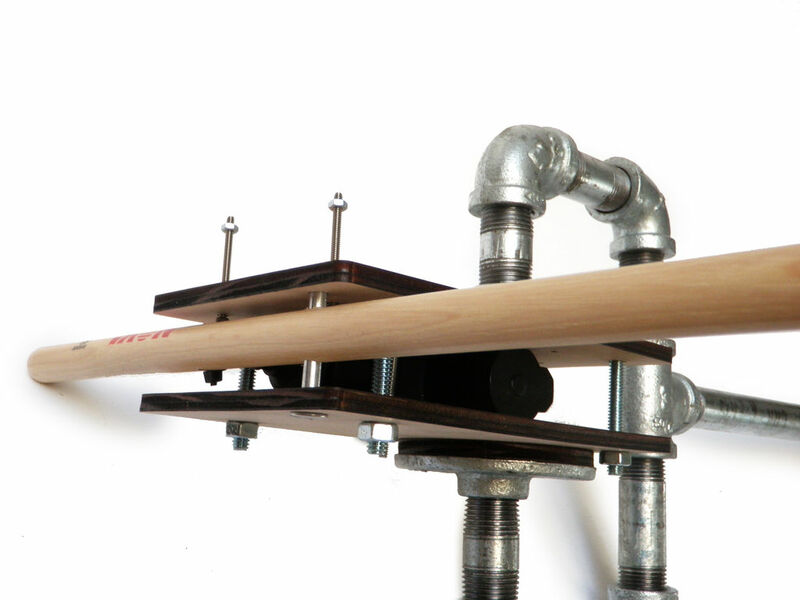 Connect the drum stick assembly to the pipe mount exactly like you did for the hi hat assembly. Attach the 24" threaded pipe to the base of the T-bracket. Once more, mount the drum sticks like you did for the previous drum stick assemblies, and then zip tie the drum sticks to the linear motor assembly. 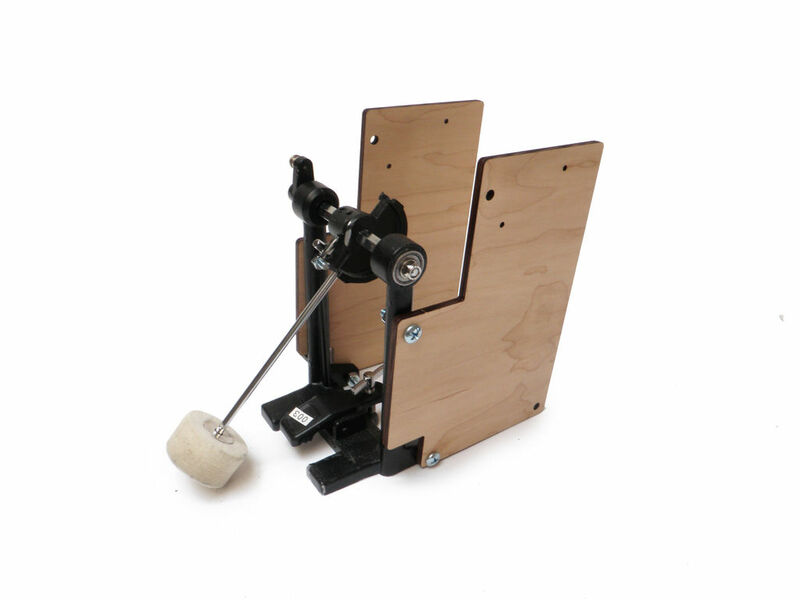 Detach the foot pedal and chain from the kick drum pedal. 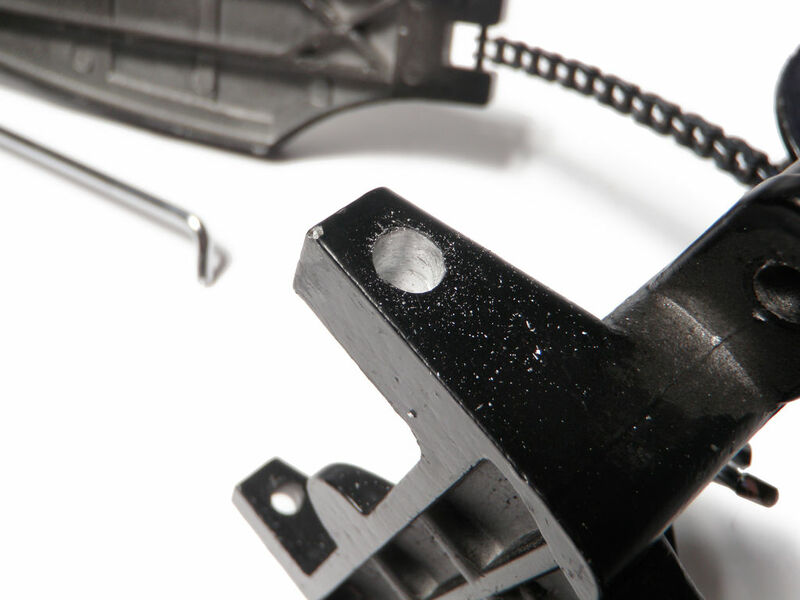 Remove the spring that is keeping tension on the pedal's rotational assembly. 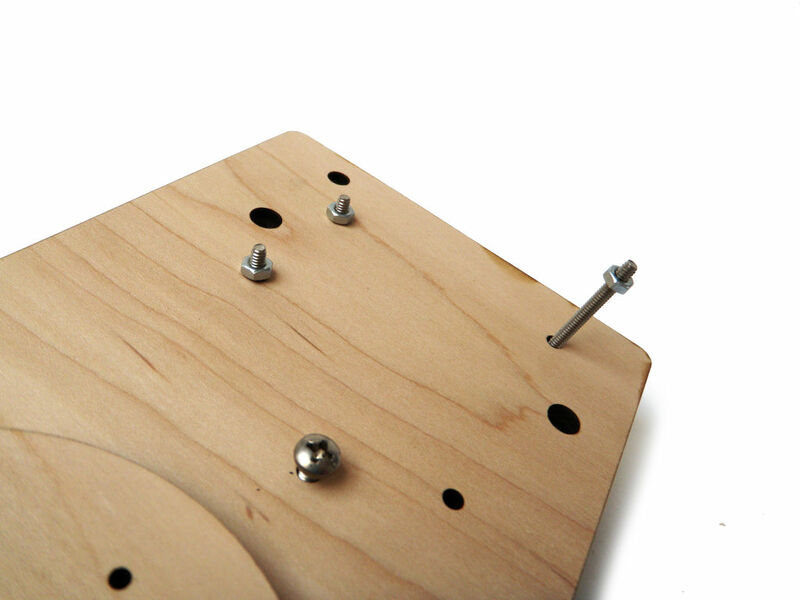 Using the mounting holes in the wooden bracket as a guide, drill 1/4" holes on both sides of the pedal. This should result in 2 holes on each side of the pedal. 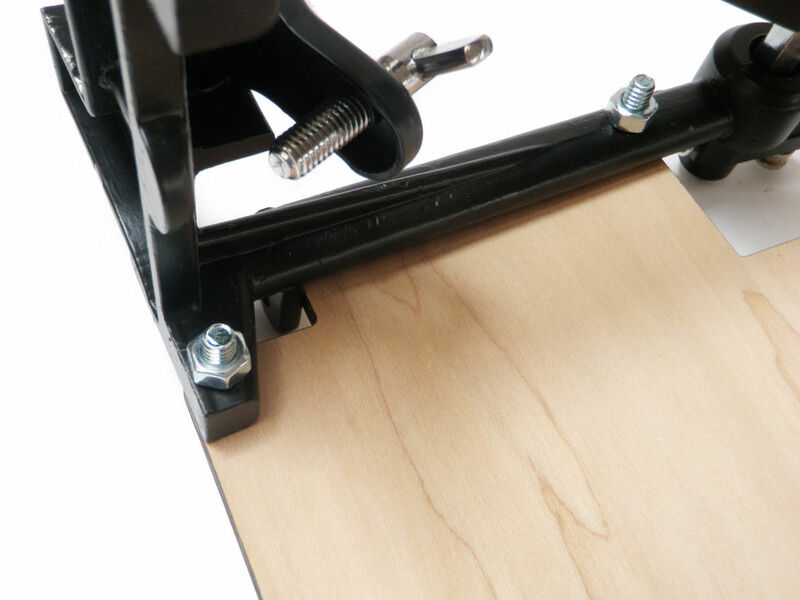 Attach the wooden brackets with 1/4 nuts and bolts to the kick drum pedal assembly using the holes that you have just drilled. Dissemble two pens so you are left only with the pen tube. 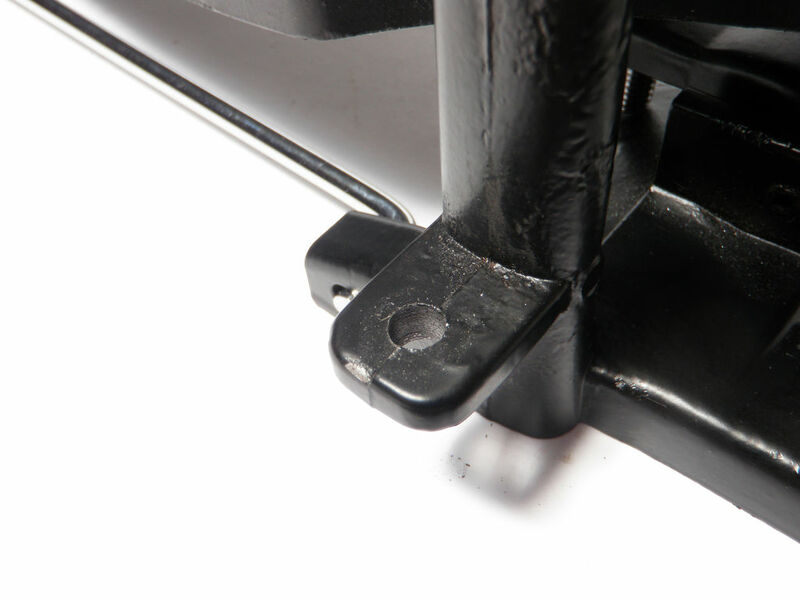 Insert 5" x 1/4 bolts through the bracket's structural mounting holes, using the pens as spacers in-between the two. 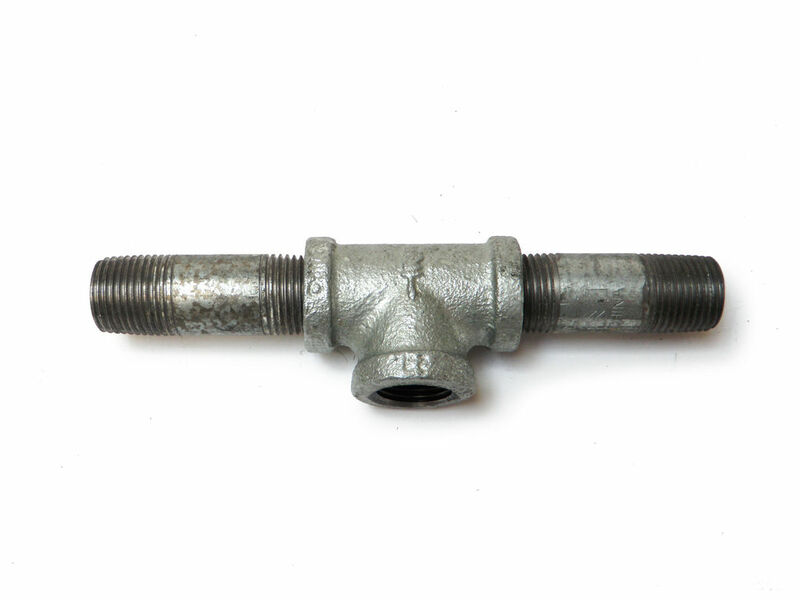 Fasten each bolt firmly in place with a nut. 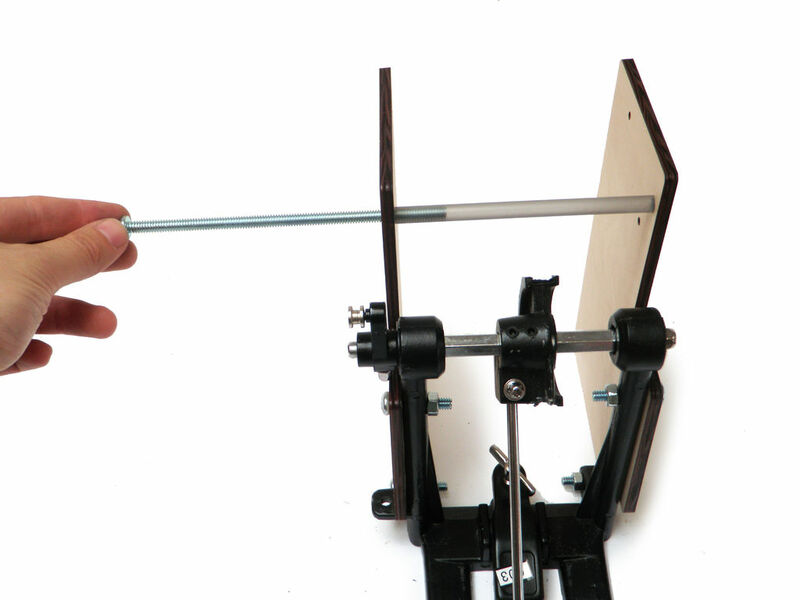 Line up the shaft of the linear motor assembly with the rotational pivot of the kick drum pedal assembly that the spring used to be attached to. 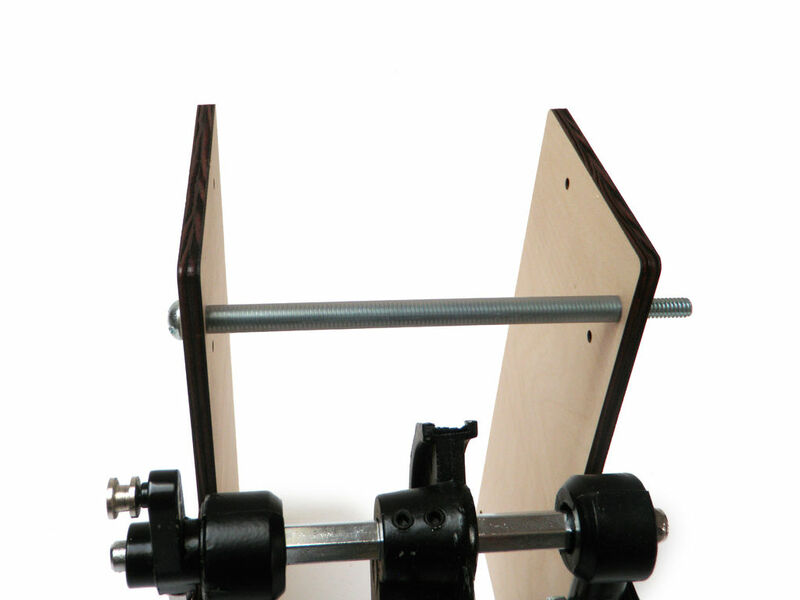 Attach the motor to the wooden bracket using 6-32 nuts and bolts. 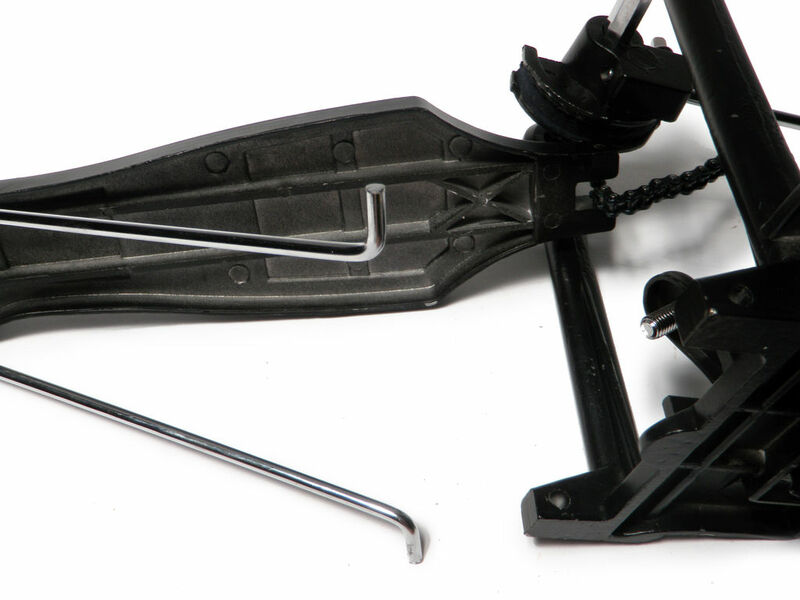 Zip tie the motor shaft to the rotational pivot of the kick drum pedal. Wire the 1/4" socket to the motor on the kick drum assembly such that the ground wire from the motor is connected to the tip, and the other wire is connected to the barrel of the jack. If the motor does not have red or black wires, designate one of the colors to be ground and the other to be power. In this case, the green wire will be ground. Take apart the 1/4" plug, and go grab about 5' of speaker wire. Solder the marked edge of the speaker wire to the ground terminal. Solder the unmarked edge to the tip terminal. Reassemble the plug when you are done. Attach one of the drumstick brackets to the snare drum by passing the steel hanger strap through the thin vertical mounting slots in the brackets and wrapping it around the drum. Fasten it tightly in place with 6-32 nuts, and bolts. Attach a drum stick assembly to the toms like you did the snare drum. Attach a drum stick assembly to the floor tom like you did the other toms and the snare drum. Insert the rods from the cymbal striker assemblies into the extra cymbal stands. 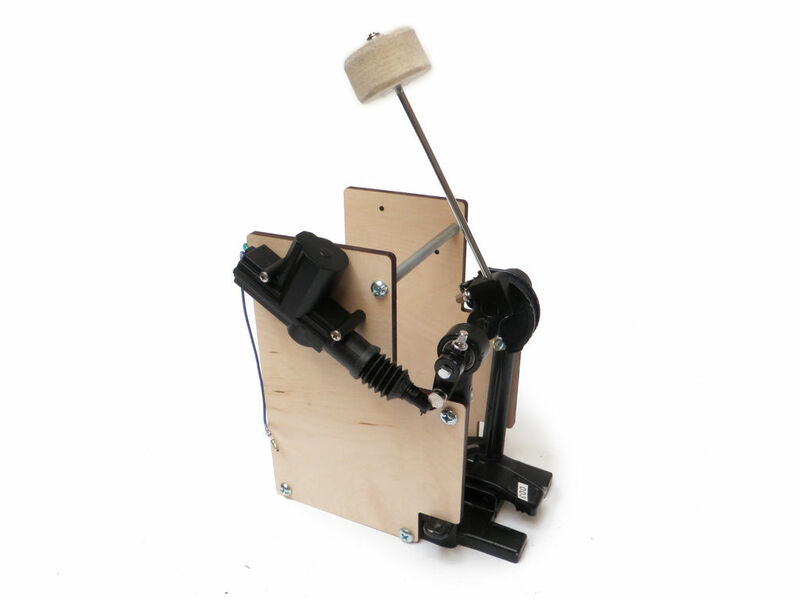 Attach the motor-controlled kick drum pedal to the drum. The motor shields need to be plugged into each of the respective Arduinos. 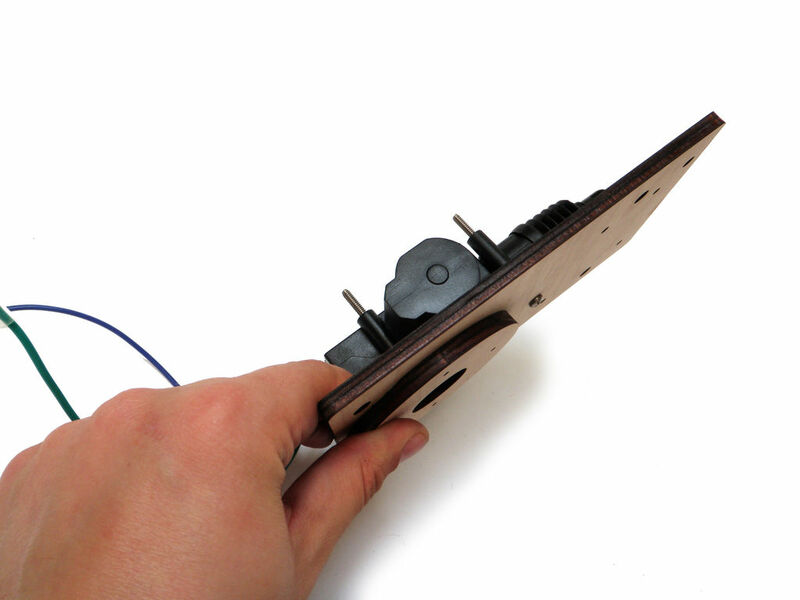 However, before you go and do this, bend the shields Vin pin so that it will not plug in to the Arduino. This is done to prevent the Arduino from getting directly connected to the voltage input on the motor controller, which is rather high and runs the risk of spiking. Alternately, if you don't want to preserve this functionality on the shield, cut the pin away entirely. Upload each respective Arduino with the code below. This is code for a robotic drum created by Randy Sarafan. Once all of the Arduinos are programmed, you will want to affix them to the drum stick assemblies. Remove the nuts from the Arduino mounting bolts that were inserted earlier. Next, slide 1/4" spacers onto the bolts. 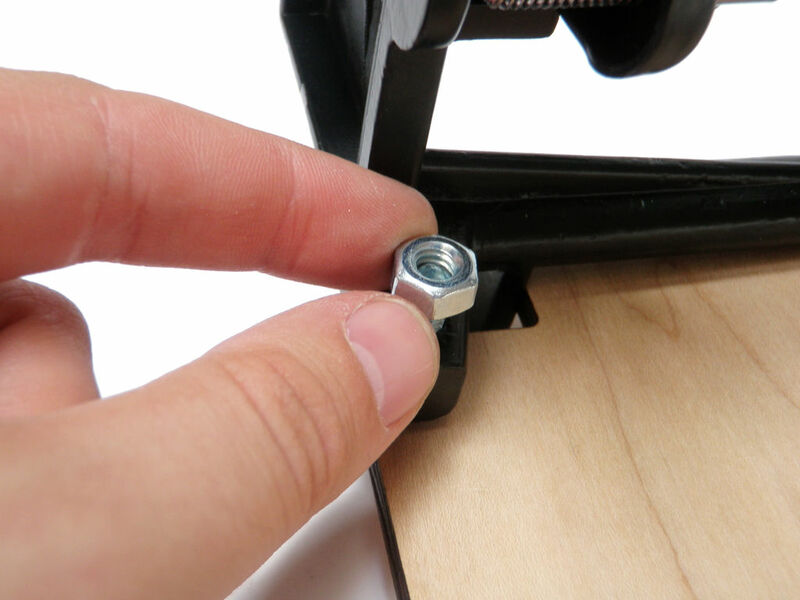 Finally, mount the Arduino using these bolts and fasten them firmly in place with nuts. If necessary, extend all of the motor wires so that they are long enough to plug into the motor shield. Cover any exposed wires with heat shrink tubing. Plug the wires from each motor into either Channel A or Channel B on the motor shield. For the most part, it is not really important which is which, so long as it is a single motor to a single channel. The one exception to this rule is the Arduino that controls the kick drum and the cymbal, but we will touch more on this in a moment. Make 3 side-by-side marks, about an inch apart, centered on each 7" x 3" side of the case. Drill each of this marks with a 5/16" drill bit. Wire each of the jacks such that the positive red wire is connected to the center terminal and the black wire is connected to the outer terminal. Mount the jacks into three of the holes side-by-side on one side of the case. Connect the wires from each of the jacks into the European terminal strip. Wire them up such that it is alternating power and ground, and each jack is supplying power to two pairs on the strip. In other words, each jack should be supplying power and ground twice. Connect the speaker wire to the first pair so that the marked edge of the wire is going to ground and the unmarked edge is going to power. Repeat this for all subsequent pairs. Pass the wires in pairs of two through each of the three respective holes in the case. Make sure the terminals strip is nicely situated inside the box. Put the lid onto the power box and fasten it shut. Install the toms above the kick drum as you normally would for any other drum kit. The snare and floor tom (not pictured) can just stand on the floor in their typical places. Adjust the height of the drumstick assemblies such that they strike the cymbal and hi-hat reliably. This may take some fussing about. These cymbals and strikers can then be positioned in their normal drum kit location. 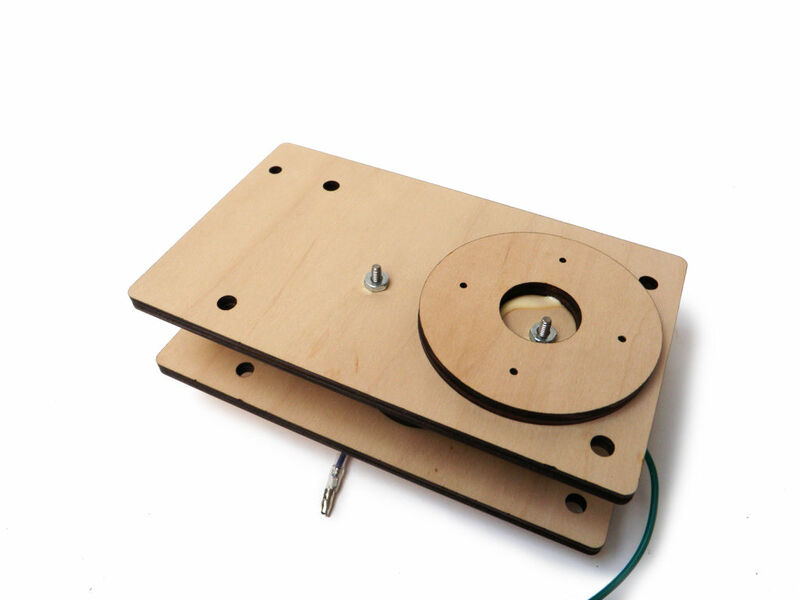 Take a speaker wire from the power supply box, and plug the marked edge of the speaker wire into the ground input socket on one of the motor shields. Next, plug the unmarked edge into the power socket on the shield. Repeat this process five times, for all of the motor shields. 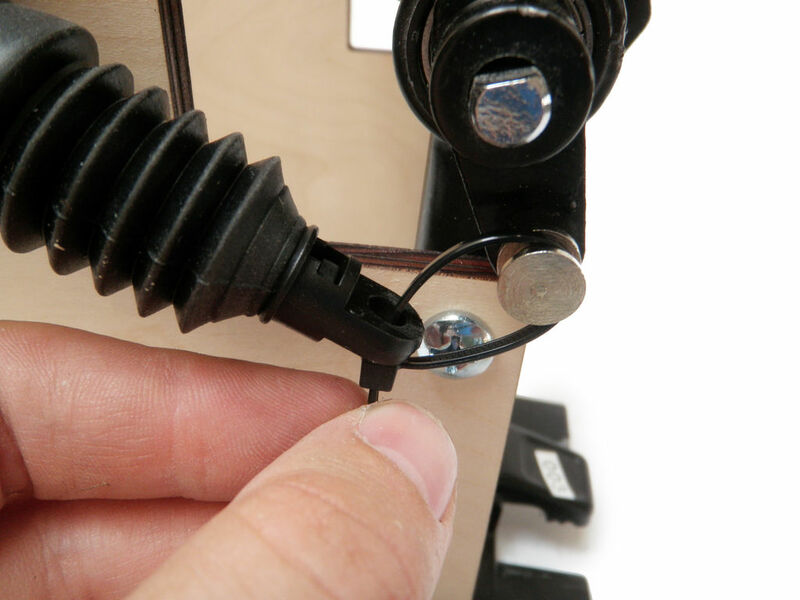 Plug the marked edge of the 1/4" plug cable into the "Motor A" minus terminal on the cymbal assembly's motor shield. 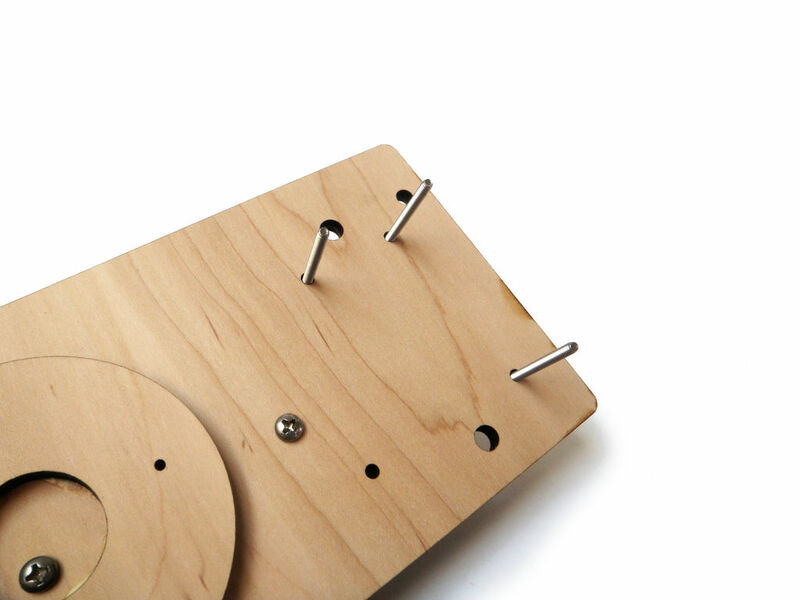 Plug the unmarked edge into the plus terminal of the cymbal assembly's motor shield. Insert the 1/4" plug into the 1/4" jack on the kick drum. Plug the three 9V power adapters into the power strip, and insert their barrel plugs into the M-type jacks on the power supply box. Plug a USB wire into each of the Arduinos and then plug them all into the USB hub. To use the drum kit, first connect the USB hub to your computer and make sure the power strip is powered on. Next, visit the Max MSP site and download Max5 Runtime (Mac / Windows). Download the attached zip file with the "robo drums sequencer57600" Max patch. Run "robo drums sequencer57600.maxpat" using Max5 Runtime. This Max patch was created by the amazing Amanda Ghassaei - Max MSP Ninja and loosely certified Instructables Genius. This project would have taken much longer, and probably have not been quite as awesome, without her world class Max MSP skills. This is pretty cool. I was actually thinking about the same idea the other day. That is what I call a PRO LEVEL Instructable! Great layout, nice images, incredible project... the whole thing is first class! Tell me about it! This project was originally sponsored by Radioshack (RIP) and the video they made to go with it didn't showcase the drums at all! I really wish I had a better video of this thing in action! Hi, awesome project, but I have a few questions. First, what amperage do the car door actuators run at? 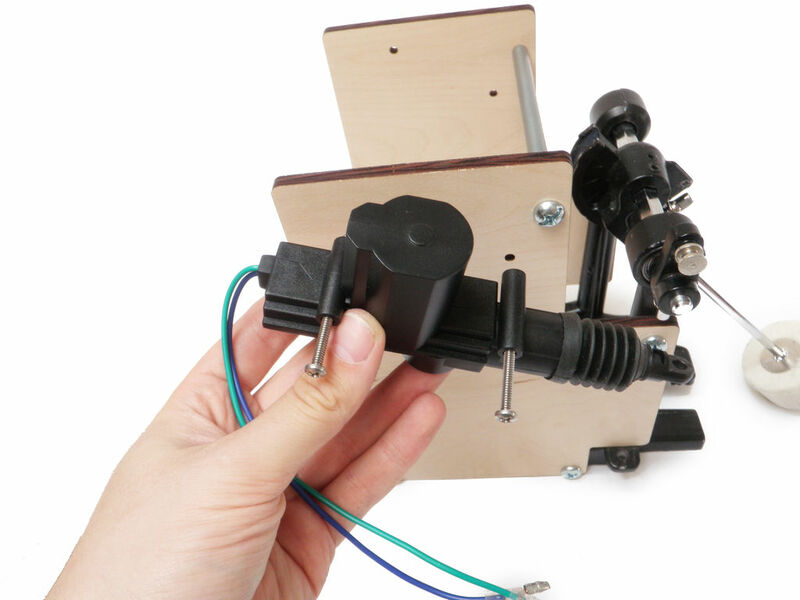 Also, instead of doing the whole audio-wire setup, could you simply plug the wires into a button switch and a power supply, replacing the arduino with a human pressing the button(this is really only concerning one drum)? I don't remember, and I don't own the drum anymore. The current is not very high. Likely much less than 1 amp. If you did that, the drumstick would only travel in one direction, and the drumstick might have not enough recoil to bounce back on its own. You might be able to work something out with a DPDT pushbutton switch (to work as an H-bridge), but I don't know if that would be good for the motor because it would never turn off in the opposite (recoil) position. Alternately, you might be able to figure something out with a SPST pushbutton and a spring (for the recoil). Hello. My name is Kyle Endsley. My peers and I are involved in an education program called STEM. Coming up in about 6-8 weeks, we will be competing in the STEM expo. That is where you engineer or design something that can help solve an issue. We have decided to choose musical engineering. Our plan is to build a robot type system that you can program to play certain things on a single drum. Our goal is that people can learn at home, on their own, and still being taught. Considering we are only in eighth grade, we are having slight issues designing everything we need. We were wondering if you could possibly send us a materials list and instructions for just one single drum. We don't have the time to do a whole system so we want to do just one drum. Our whole idea behind this is that practicing physically with someone is better than just watching a video. Saying all of that, we ask again, could you possibly send us a materials list and instructions for just one single drum. We would greatly appreciate it as it would immensely help us. Kyle, this is what I ended up doing (building just the snare) and got it working. Holler if you have trouble with it. All of the drums essentially use the same electronics. In the instructions I say to buy 6 of everything. You only need 1 of everything. 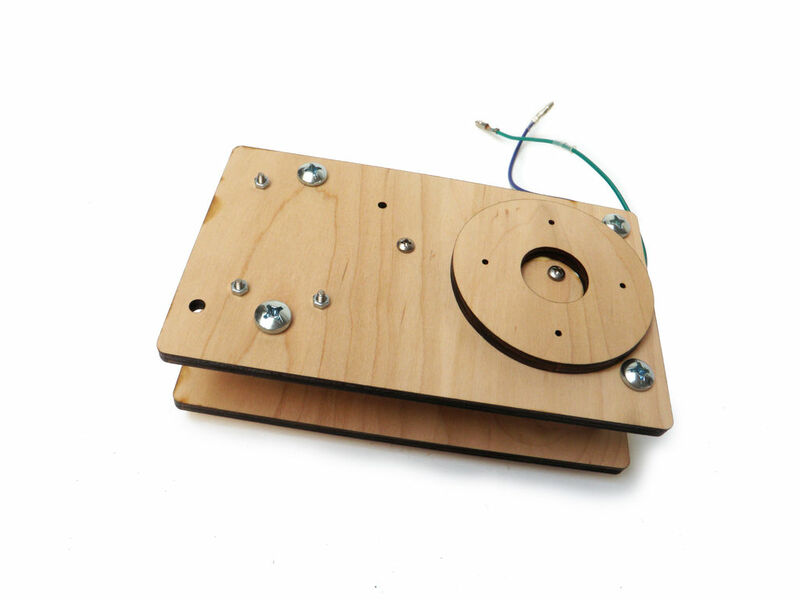 Basically, you will need an Arduino, motor shield, 1-2 motors, a 12V power supply, and a USB cable. I would just follow the instructions for the snare drum part of my Instructable (and ignore the other drums). The code will need to be rewritten to play particular songs. However, the way my sample code is written, it should currently work with just 1 drum track. Is the STEM expo a nation-wide event, or a local event? Randy, super awesome. I have the same issue as another poster...when I run the sequencer it's lighting up the Arduino perfectly, though the motors aren't moving. Any suggestions on what to try? I'm using the R3 Motor Shield, thx. Did you bend the shield's V-in so that it is not plugged into the Arduino socket and apply 12V power separately to the shield? Sweet, got it working! We didn't have power plugged into the shield...that did it. Thx againa! how is the communication between max and the arduino? Would it be possible to replace the max sequencer with one of pure data or even a baby seq with the integrated 4017 and use the same code? Basically, max is sending out numbers as serial data (a particular number to each drum). Every drum has a number which triggers it. Each program is listening to the serial stream using timer interrupts and taking in all of the numbers, all of the time, in the background of the sketch (interrupts are essentially parallel processing). If the particular drum happens to receive the number it is listening for over serial, it triggers (the rest of the numbers are ignored). You can have anything send this serial data. If you use a 4017 decade counter, you will need to rewrite the Arduino code fairly dramatically to work with this new scheme. Or have a second Arduino handling the 4017 inputs, and then have that Arduino spitting out serial data. You are likely better off having a parallel in (shift-in) shift register than a decade counter, which is more similar to a parallel out (shift-out) shift register. I think the simplest thing will be to write my own code or use signage and send the signals directly from PD. 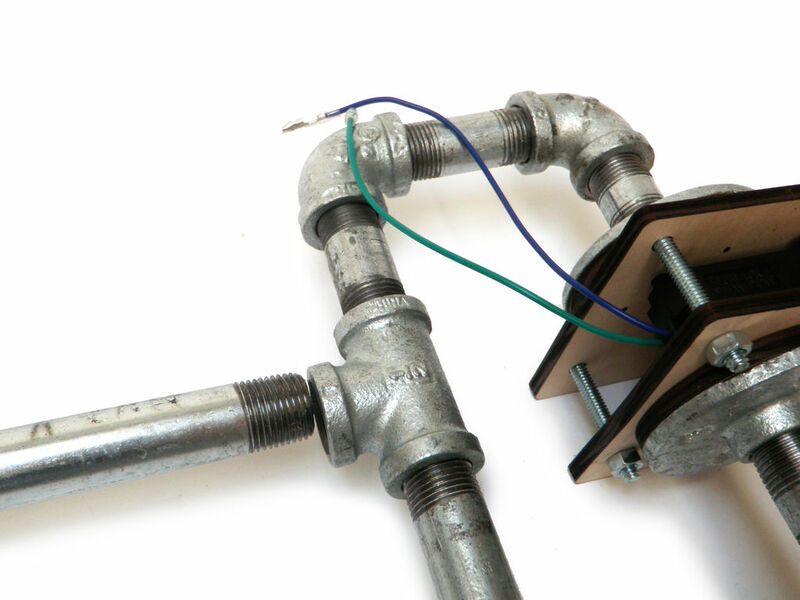 How did you manage the opening and closing times of the actuator? yesterday I was testing with values between 20 and 50 ms in each direction, and with a delay of 20 in between, but I could not have a regular movement, where the actuator always reaches the same point. Any recommendation in this regard? I don't know. I have not worked on this and while and don't even have the drum anymore. I do remember, the recoil from striking the drum helped retract it. I always got fairly consistent results though. I made one set of drum sticks to see if it might work to build a "little drummer boy" prop for my Christmas light display. Instead of using the custom program, I used a different sketch so that the drum sticks could read data from Vixen. Vixen is a sequencing program used to synchronize Christmas lights to music. It works well, I just have not finished making it into the final form yet. Thanks for the inspiration, templates and instructions. 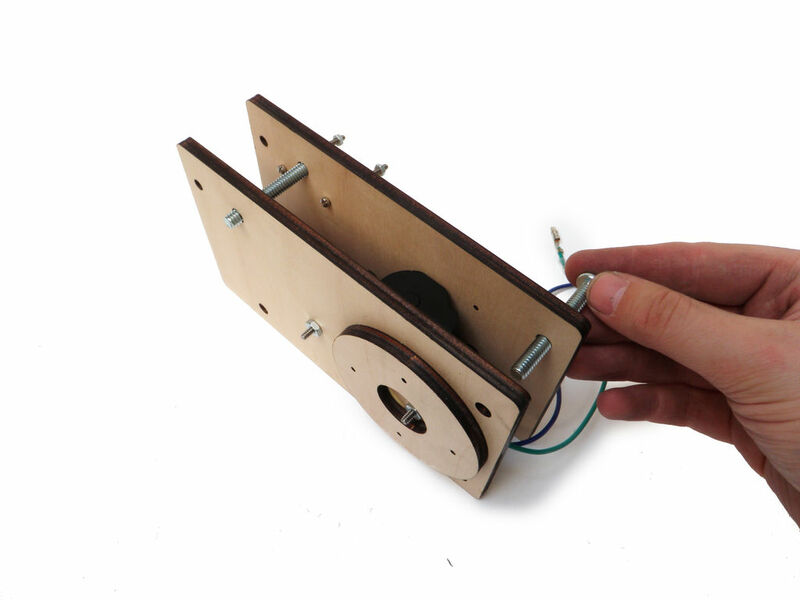 Why did you have 2 sticks/motors and 1 arduino per drum? Why not have 1 drum stick per drum, and therefore 1 arduino servicing 2 drums, thus halving the number of arduinos, motors and motor shields? Thank you though - its a nice project and you've helped me a lot with my similar project.